After being part of the mock Newbery group Heavy Medal in-person discussions, both of us were eager to share this empowering experience with kids. Armin is a children’s librarian at Berkeley Public Library who was on the 2015 Newbery Committee. Mary Ann is an elementary teacher librarian at the Berkeley Unified School District. We met originally through the Association of Children’s Librarians of Northern California and were both members of ALSC’s Bill Morris Seminar. We teamed up to host a book club that was open to all 4th and 5th graders at Emerson School. 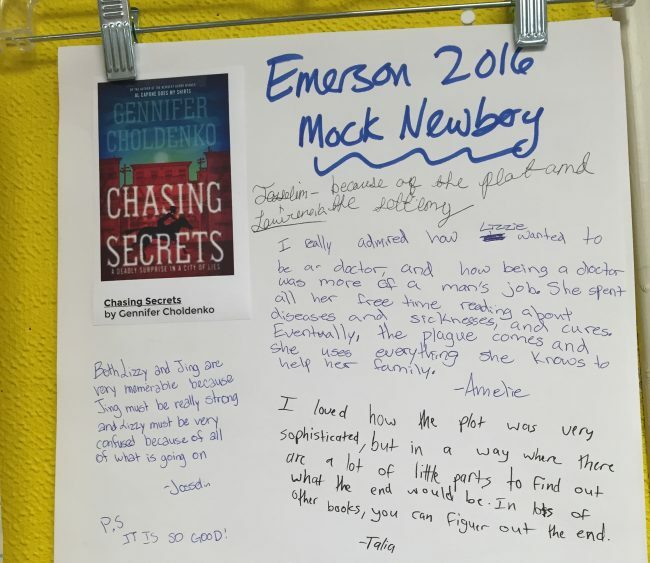 We have run our Mock Newbery Book Club for the past three years, and would like to share our experiences. It has been terrific having a buddy librarian, so we could support each other and interact with the kids in small groups. Some days, we had 30 kids show up for lunchtime and other times it was much smaller for our informal meetings. 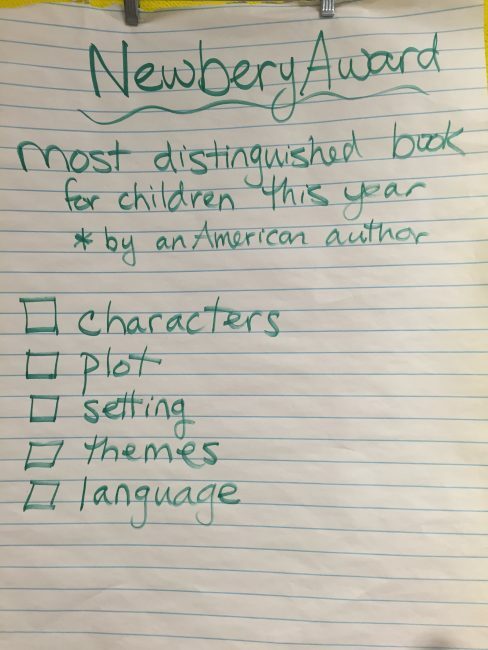 During our informal meetings, we facilitated conversations among the kids, encouraging them to talk about what they had read that week, and asking them to think about how they would evaluate this using the Newbery criteria. We constantly referred to this poster, which shows the criteria that the actual Newbery Committee uses. We asked kids to evaluate the books they’re reading, talking about whether they liked it, and also prompting them to think a little more deeply about what the strengths of the book might be using the Newbery criteria. Do you think the characters were well developed? Is there a place that shows that? Were the secondary characters fleshed out, so you could imagine them as real people? How well did the author describe the setting? Could you put yourself in that setting? Did the plot hold your attention, or did it have slow moments that didn’t work with the story? Did you notice the language that the author used? Was it effective? Were the themes meaningful to you? Maybe to the characters in the book? What’s interesting is that we found that these questions helped us engage students even if we hadn’t read the books yet. They also helped kids become interested in what their friends were saying about books, spreading this magical “book buzz.” Sometimes, they came back from reading a book knowing exactly what friend they would recommend it to. We watched stories like Swap and All the Answers spread from a small group of devoted readers to the larger classroom community. 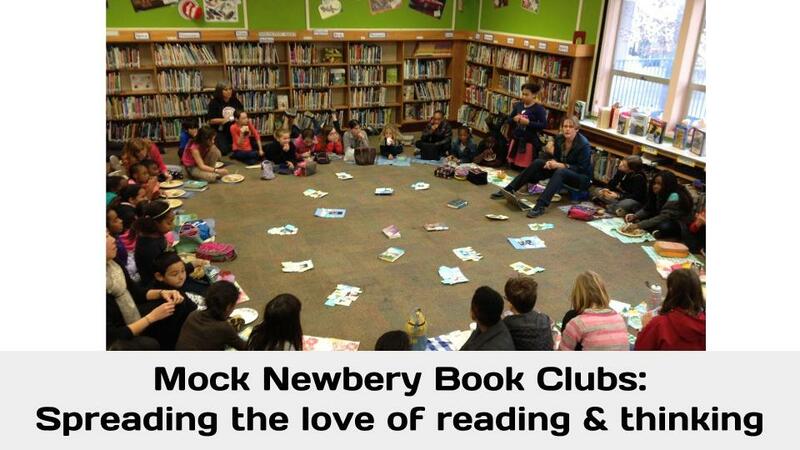 Our Mock Newbery group met from September through January. In addition to the informal weekly meetings, we held four whole-group mandatory meetings. We advertised this in the school (promising treats) and made sure that there were no big conflicts with other lunchtime activities. We share the newest books and record their opinions. We look for books we can recommend that are particularly diverse (for example, kids really responded to Kekla Magoon’s Shadows of Sherwood and Kwame Alexander’s The Crossover). 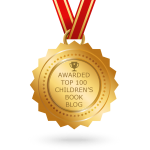 We also look for books that are accessible for our developing readers (one year The Life of Zarf was high on the kids’ list). The key is to encourage kids to become part of this community of readers and to find their own voice. The easiest way to record this has been simple book posters. After talking with students, we asked them to jot down their thoughts — very informally. These posters were open for the posters to look at and see what their friends liked. We found that just asking the students to submit written evaluations didn’t work because it seemed like more WORK for the kids! These posters have been a great form of passive readers’ advisory. In order to honor students’ voices, we have encouraged them to nominate books similar to the way Newbery Committee does. 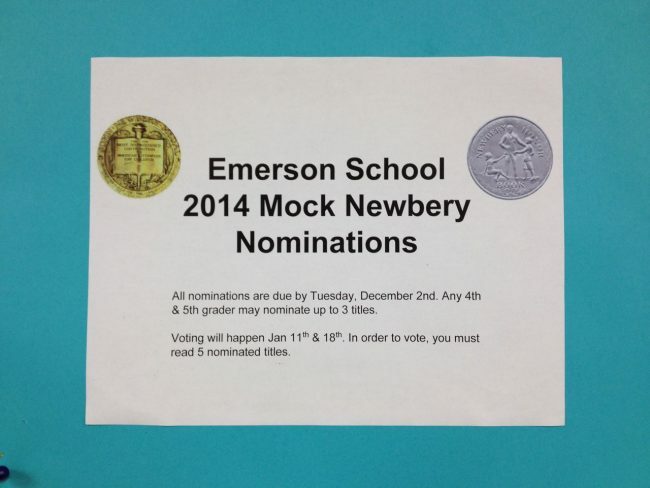 Two kids have to agree to nominate a title that meets the Newbery eligibility requirements. We then managed and massaged the final list to ensure a wide range of diversity. We (the organizing librarians) limit the final list to 10 titles so that it isn’t overwhelming and so that we can focus our discussions within the time allotted. A final goal we had was modeling civil debate and discussion for our students, showing them how to engage critically and politely, even when they disagreed. We followed KT Horning’s guidance (essential reading for anyone starting a book club), always starting with the positive. We then encouraged kids to share their concerns and talked about how not every book is for every reader. Then we tried to compare it with other books that same year. This is hard work and the kids really loved wrestling with these difficult decisions. Akira (not her real name) has come to our book clubs ever since the beginning of 4th grade. At first, she mainly watched and listened, and then visited with friends. She dipped her toe into the the water of book club, and liked some of the easier, more popular books. By 5th grade, she was coming into her own as a reader, starting to express her opinion more frequently and more strongly. Akira embodies a success story for the type of student we are trying to reach. Books were not high on her list of priorities, and she was not always confident as a reader–in 4th grade, she often didn’t finish the books she started. Book club has helped her create an identity as a reader who knows her opinion matters–this is critical as we send our students, especially our students of color, off to middle school. An essential part of that has been making sure every child feels heard. Our informal lunch meetings, with two adults in the room, make this a richer experience that works without feeling overwhelming. Our final meetings thrum with excitement. Over 40 kids have sat through our discussions for their whole lunch hour, eating, sharing opinions and listening to friends–and giving up recess! We have two 45 minute sessions in January, with discussions facilitated by both librarians. We invite all students to participate because we want to hear everyone’s thoughts; however, we require students to read at least 5 nominated titles if they want to vote. We discuss each book for 5 minutes, inviting students to share their thoughts on the book’s strengths and weaknesses. We only compare books to others in our nominated list. We conclude with a formal ballot for those who have read at least 5 of our titles. One new strategy we tried this year, with great success, was inviting students who had read fewer than 5 titles to participate in an informal poll–they loved this and it gave us interesting results. Throughout, we have tried to make our approach inclusive and flexible. We’ve had incredible feedback from kids and parents. The kids love the chance to visit with each other, seeing friends that they don’t always get a chance to talk with during class time. Parents have told us how much their children are reading, engaged by the big decisions they’re trying to make. And we have loved the opportunity to bond together as professionals, sharing ideas and our love of reading. Today’s post is co-written by two guest bloggers. Armin Arethna is a children’s librarian at Berkeley Public Library. She served on the 2015 Newbery Committee. Mary Ann Scheuer is a teacher librarian in Berkeley Unified School District. She writes the blog Great Kid Books. 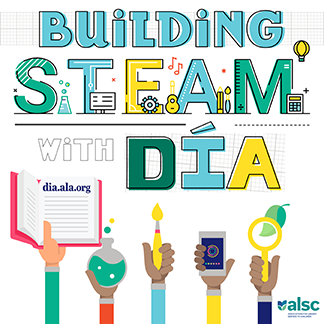 ALSC wants YOU to suggest books for the youth media awards! 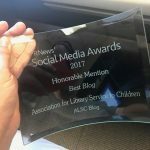 As someone who is starting a Mock Newbery this year, a sincere THANK YOU for a thoughtful, organized article. I particularly appreciate the posters with informal feedback on books – I’ll be making these for our library this week. One question: what is the essential reading referred to by KT Horning? I’d like to read it and share it with the teachers leading our Mock book club. Much thanks! I am also a newbie. Our elementary school does not have a school librarian. Volunteers keep our library open. I am a retired librarian that loves to read and book talk to 6th graders so that is the group I am targeting. I, also, wonder who is KT Horning and what is the essential reading by him/her? How did the cooperation between public and school help with this event? Thanks so much for your outline of your Mock Newbery. Very, very helpful. Maybe “From Cover to Cover”. It was assigned reading in our Childrens Book class. I forgot to ask if there were any forms you had the students fill out?